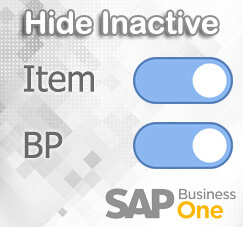 With a lot of enhancement on SAP Business One version 9.2, now you can easily hide your inactive items or inactive Business Partners on choose from list that showing up on reports and any marketing documents. Let’s take a look at General Setting menu. If you had a lot of inactive master data, and need to ‘simplify’ your choose from list only for showing active master data, we hope we can help you with this simple tips. For BP, open BP Tab. Then click Update button to save thissetting.